Earlier this summer my family took an amazing trip to Custer State Park in the Black Hills of South Dakota. 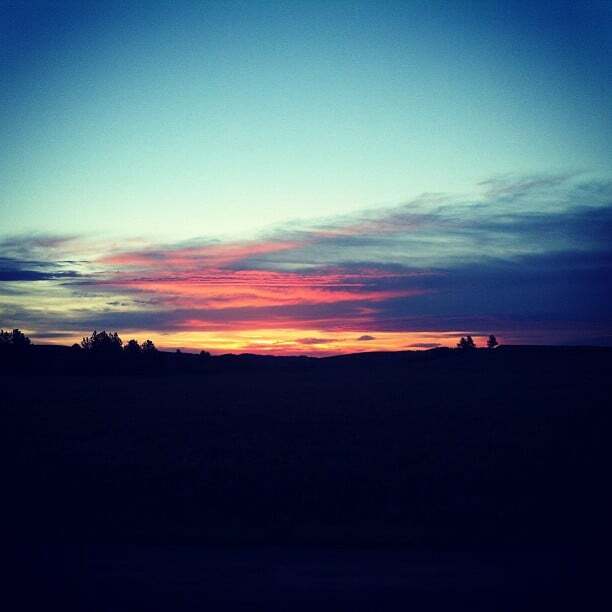 The most memorable adventure was a special sunrise adventure on the Wildlife Loop. The power of the experience caught me off guard. It was humbling and awe inspiring. Below you’ll find parent-to-parent tips for seeing the most wildlife possible during your visit to the Black Hills. 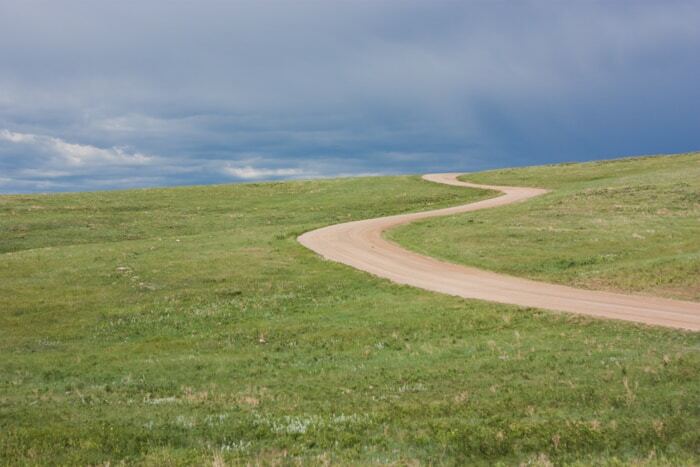 The Wildlife Loop at Custer State Park is a MUST-SEE 18-mile loop through the park’s open grasslands and forests. 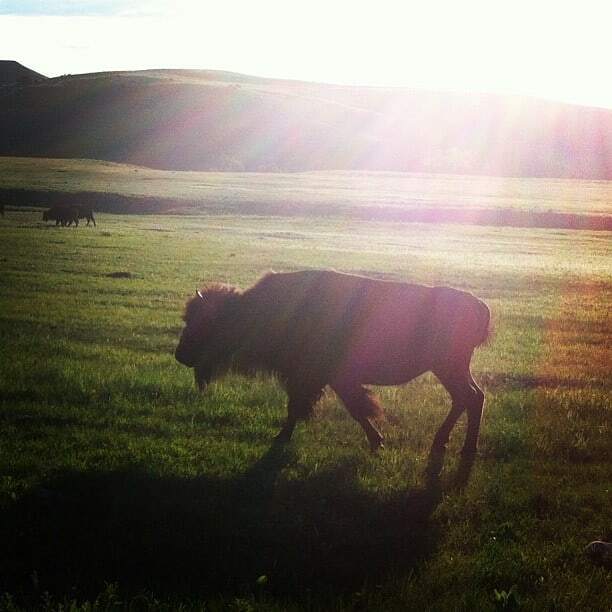 On our trip around the loop, we saw bison (lots and lots of bison), pronghorn, prairie dogs and a variety of birds. Visitors have also reported commonly seeing whitetail deer, mule deer, elk, coyotes, burros, and birds of prey. 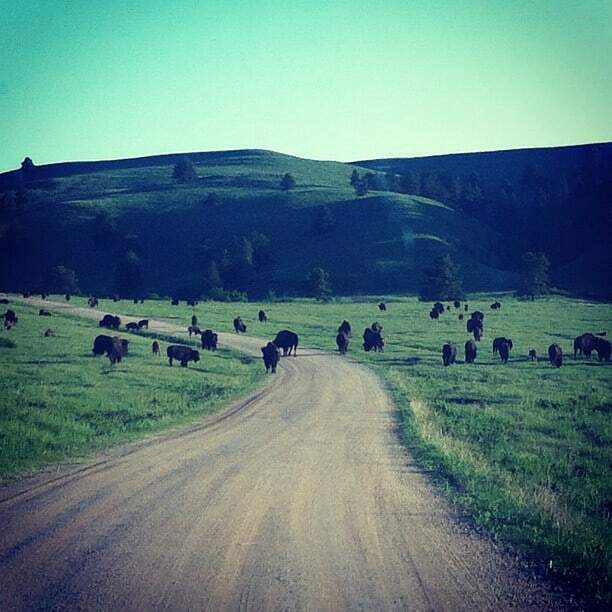 Driving Custer State Park’s Wildlife Loop is like being in a LIVE nature show. During the summer the park offers daily Jeep Tours and Back Road Hayrides around the loop. It is recommended you RSVP in advance because the tours often fill up. I admit, this WAS on our to-do list until, well honestly, my husband convinced me it was a waste of money. He’d been chatting with visitors and rangers at the park getting the 411 and basically discovered that the wildlife was so abundant that, if you went at the right time, you could see a variety of animals from the comfort of your own vehicle. You MUST plan your adventure for the crack of dawn or as the sun is setting in the late evening. I’d go as far as saying, it is waste to go mid-day. Make this a special event. Split your family up and take ONE child at a time. My daughters are complete opposites. We have a night owl and an early bird. My husband took our daughter Rose in the evening and returned with stories of ground hogs, birds, and the gorgeous buffalo photo above. The next morning Nana, my daughter Quinn, and I got up at 4:30am so we could be on the plains as the sun started to rise. What we found was a herd with literally hundreds and HUNDREDS of buffalo slowly grazing and migrating across the plains. I wish I had more photos to share with you. 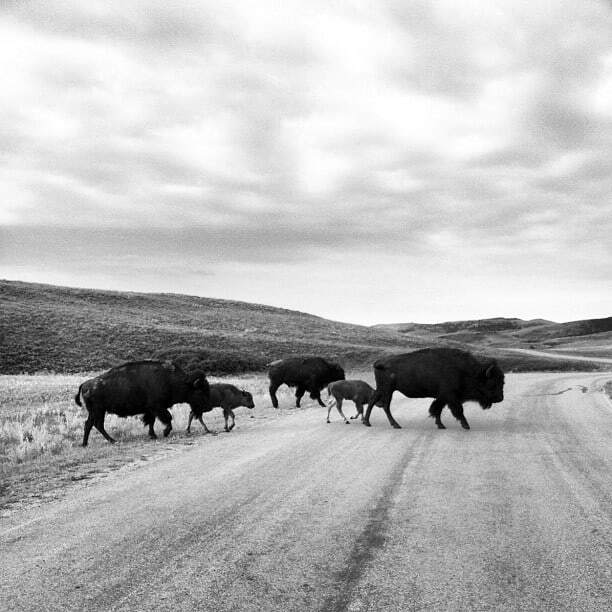 Photos that show truly how many buffalo we encountered. The truth is… when you are in the middle of something so powerful and awe inspiring, you don’t want to take pictures. You want to embrace the moment and just soak it all in. As we left the area, I realized I had only taken ONE photo, so I grabbed this quick shot (above) with my iPhone. This is what we found over the hill. A herd of buffalo grazing quietly. I was able to capture a nice shot of this one galloping across the road to greener pastures. I just smiled and hummed the old song. This section of the Black Hills of South Dakota is amazing. If you are looking for specifics on the map (PDF): we took Oak Draw Road , turned down North Johnny Road , passed through the Blue Bell area and then ended our adventure at Legion Lake Lodge. When my husband left for the Wildlife Loop, he told me, “Be back in 45-minutes or so.” They returned hours later. Don’t be afraid to embrace the adventure and let the kids set the pace. Shift out of your everyday “get ‘er done” mode and follow the cadence of the land. Don’t RUSH this part of your vacation. My personal goal was to end our Wildlife Loop adventure sitting by the lake with an iced coffee in hand. 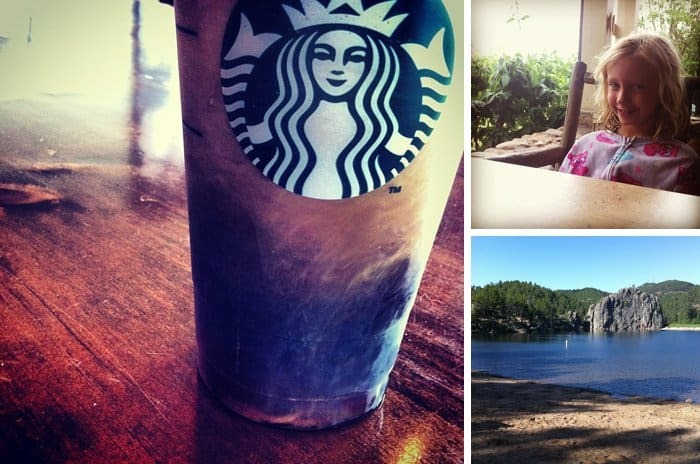 There is a Starbucks located within Legion Lake Lodge and I was excited to take advantage of it. The lodge opens at 7am. I was worried we’d have to dilly dally around after finishing the loop so I could get my coffee. We left our cabin at 4:30am and … we didn’t finish the Wildlife Loop until after 9am. It is THAT cool. To be truly honest with you, [blush] I wasn’t originally keen on visiting the Black Hills. That being said, this was truly one of the best vacations I’ve ever taken. 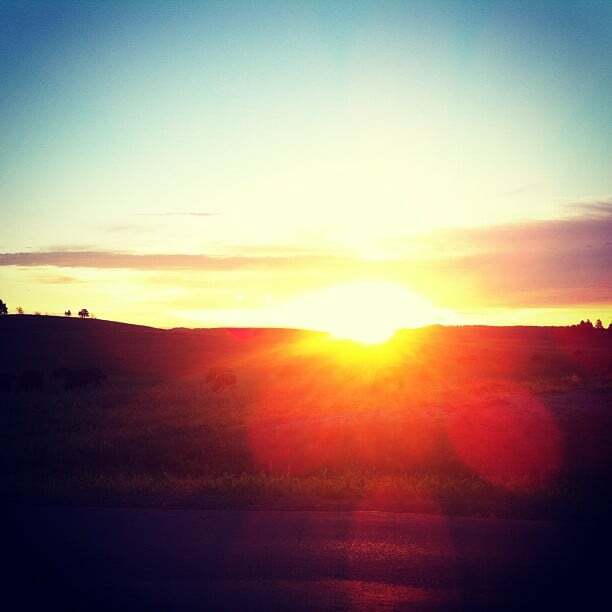 Are you planning a trip to the Custer State Park? Let me know if you have any questions in the comments below. At Custer State Park you’ll not only find beauty in nature, but also in commissioned art. Keep your eyes open for tiny details. 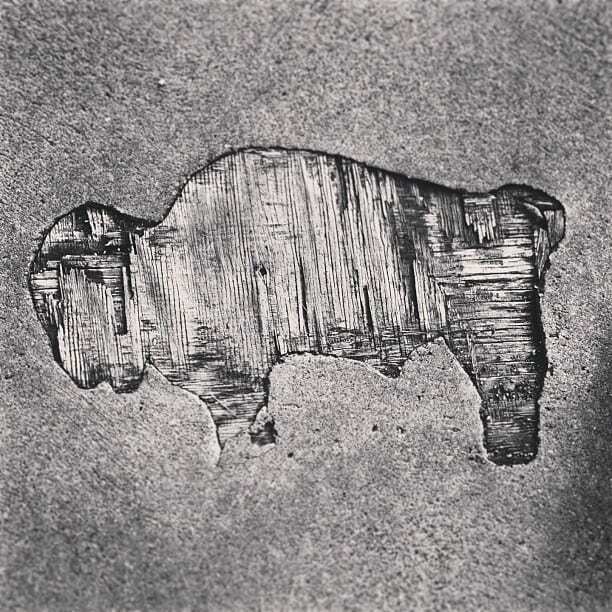 For example, I found this cool wood buffalo in the sidewalk near the nature center by the State Game Lodge. Also, be sure to pause and admire the beauty of the lodges. If time permits, stop by the State Game Lodge and ask about the Custer State Park artist in residence (PDF). Each summer they host an artist to create based on their experiences at the park. The photographer who was there when we visited was unbelievably talented. If you have the opportunity, try to speak with one. They are another great source of information. We are from New England. In the summer of 2014 we drove out to South Dakota, saw the Badlands, Blackhills, Custer, Mount Rushmore and our ultimate destination Yellowstone. 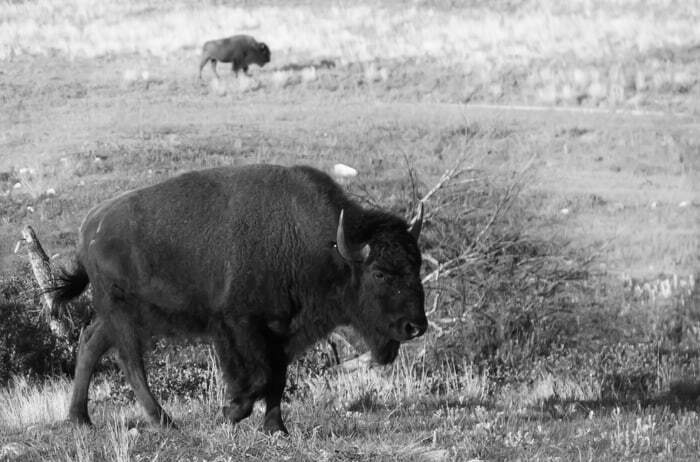 My three boys talk more about the buffalo they saw on that trip than any Disney or amusement park ride. America and our National Parks system has so much to offer! We are more night owls than early morning people. What time frame would your hubby recommend for an evening drive? Thanks for your blog and the tips!